Agricultural Economic Insights How Big? A Look at the Size of Beef Operations in the U.S. The most discussed trend in U.S. agriculture is likely the declining number of U.S. farmers and ranchers. This trend, combined with ever-growing global demand – has set the wheels into motion for U.S. farming and ranching operations to become larger over time. This post evaluates the distribution of U.S. beef operations by size. The most discussed trend in U.S. agriculture is likely the declining number of U.S. farmers and ranchers. Combined with ever-growing global demand, this has led to larger U.S. farms and ranches over time. With operations expanding, many wonder just “how large” farm and ranch operations have become. 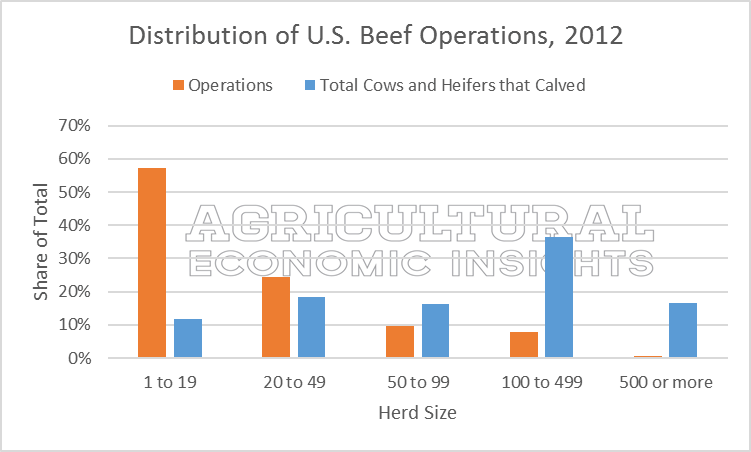 In Figure 1, the distribution of U.S. beef operations in 2012 is shown by two measures. The first measure is the number of operations by cow-herd size, shown in orange. In 2012, 57% of beef operations had fewer than 20 cows. The fact a majority of U.S. cattle operations are small-scale probably comes as a surprise to many. On the other end of the spectrum, fewer than 9% of U.S. beef operations have herds of 100 or more cows. The second measure for observing the distribution of U.S. beef operations is the total number of cows by cow-herd size, shown in blue. While a majority of operations have fewer than 20 cows, these operations account for less than 12% of the total U.S. cow-herd. The 9% of beef operations with herds of 100 or more cows account for a majority of the U.S. herd (53%). Concentration is most evident with operations having 500 or more beef cows. Collectively, these account for less than 1% of all beef operations but 17% of all beef cows. Figure 1. Distribution of U.S. Beef Operations, 2012, by Herd Size. Data Source: USDA Census of Agriculture, 2012. While the distribution is interesting, it is helpful to consider how these data have shifted in recent years. To do this, data from the 1992 Census of Agriculture were evaluated. At a high-level, things have not changed too much over 20 years. In 1992, there were an average of 42 beef cows per beef operation. In 2012, this stood at 41. Digging into the data deeper shows a shift by herd size. 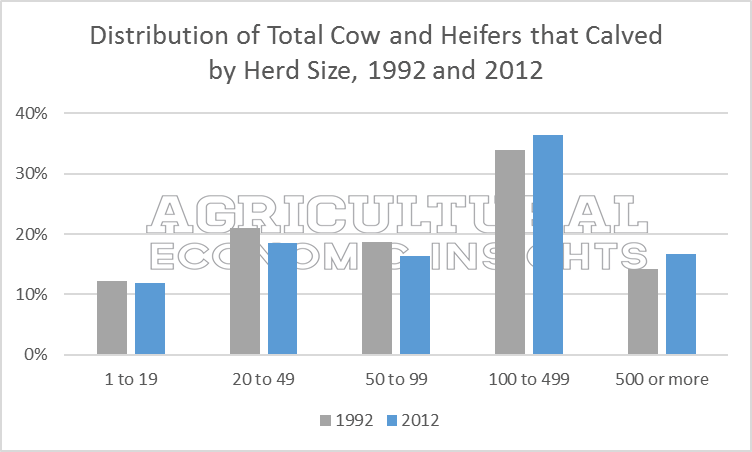 In figure 2, the distribution of total cows by herd size is shown for 1992 and 2012. In general, smaller herds accounted for a smaller share of total cows in 2012. Specifically, those with fewer than 100 cows accounted for 47% of total cows in 2012, down from 52% in 1992. On the other hand, larger herds have accounted for a growing share of total cows. Operations with 100 or more cows represented 48% of all cows in 1992 but expanded to 53% by 2012. Operations with more than 500 head also represented an increasing share of total cows, expanding from 14% in 1992 to 17% in 2012. Figure 2. Distribution of Total Cows and Heifers that Calved by Herd Size, 1992 and 2012. Data Source: USDA Census of Agriculture, 2012. When looking at any industry, the distribution of production is typically insightful. For U.S. beef production, a majority of beef operations have fewer than 20 beef cows while a small number of large-scale producers (the 9% of total operations that have 100 or more cows) manage a majority (53%) of the U.S. herd. From 1992 to 2012, small shifts in the distribution of beef cows have been observed. While the average head per operation was slightly smaller in 2012, large operations account for a growing share of total cows. Small operations (those with fewer than 100 cows) accounted for a majority of cows in 1992 (52%), but this shifted by 2012 when large operations (those with 100 or more cows) represented the majority of U.S. beef cows (53%). Looking ahead, the USDA will be conducting its 2017 Census of Agriculture early in 2018. The results of this Census will be important for monitoring and tracking trends such as these. This article was originally featured in the July 2017 issue of Progressive Cattleman.